Inspan Infotech, who is mainly in to distributing motherboards, hardware and computer peripherals has announced the launch of a unique product. 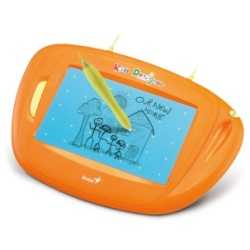 Known as the Genius Kids Designer, this gadget is a pen tablet for children. Designed for the age group of 3-8 years, kids can use this pen tablet to draw and paint pictures, write the things they want and even use this as mouse to play their favorite games. The game software intends to inspire kids to accelerate their learning skills in colors, shape, math, thinking, etc. Launched for the first time in India, the tablet boasts of a 5-inch x 8-inch large working area (a screen of sorts!) . The pen clip is designed for easy storage keeping in view the age group it is addressing. The tablet is can connect to a PC using Windows 7/Vista/XP using an USB Port. In the days of the iPads and the Android based tablets, a product targeted at children is certainly unique! That said, if you are of the opinion that tablets are purely meant for them adults, think twice for you seem to be oblivious about the fact that nowadays, even two year olds are quite comfortable using the iPad. Don't believe us? Take a look at the video here! The pen tablet is priced at Rs. 3,995 and is backed by a 1 year warranty.